Timm Prideaux and Jim Lombardo were both Case High School alumni. Timm graduated in 1970 and Jim in 1971. They became friends in classes and clubs. 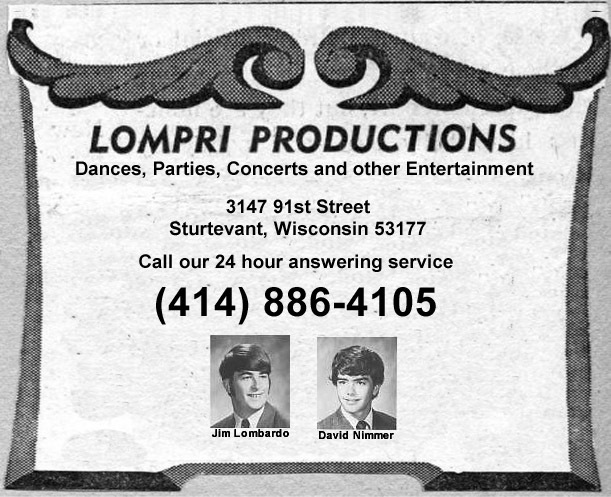 In April of 1969 they formed Lompri Productions using the first 3 letters of both of their surnames. Jim Lombardo and Timm Prideaux were co-owners of Lompri Productions and were young entreprenuers. 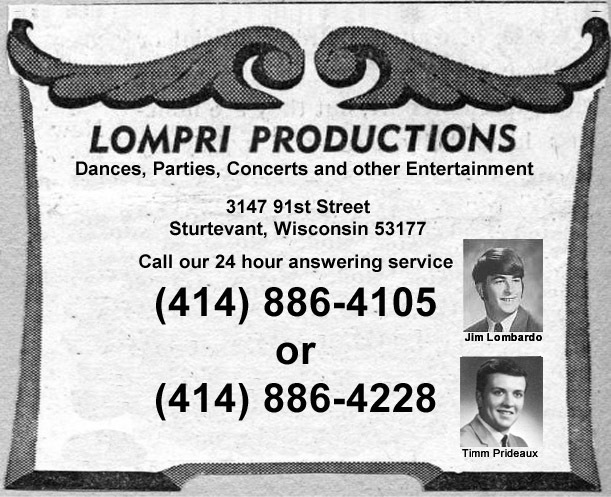 Through Lompri Productions they sponsored many dances, parties, concerts and other entertainment around the Racine and Sturtevant areas. Lompri Productions became the booking agent for "The Line's End" (a famous local rock band made up of all Case High School alumni) in 1969. Lompri Productions booked "The Lines End" for dances in Racine, Burlington and many other areas- almost every weekend. Lompri Productions were also the booking agent for other local rock bands such as "Tony’s Tygers", "The Skunks", "Butter Fat", "Back Yard Majority", "The Kinetics" and many more. Lompri Productions sponsored many events for the radio station WOKY and Bob Barry, WOKY’s leading radio personality. Bob Barry would accompany the events with record giveaways. Lompri Productions also sponsored a show headlined by the world famous rock band "The Byrds" at Memorial Hall on May 29, 1969. "The Lines End" opened for "The Byrds" show. Lompri Productions also became a record label and a dance club. Dave Nimmer (1971 Case High School alumni) took over Timm Prideaux’s position and became co-owners with Jim Lombardo in 1971, keeping the company name Lompri Productions.